Full-On Fit! 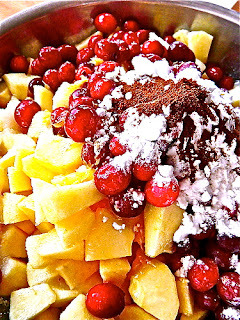 : Vegan Apple-Cranberry Cobbler...Yum!! Although I don't consider myself to actually be a vegan, I have noticed that as I continue on my journey to eat and be healthier, I have started to become much more open to different lifestyles of eating than I ever thought I would. This past weekend I was with one of my girlfriends, and we decided to whip up a yummy dessert for a small get-tother on Saturday night. We got onto her Pinterest page (I don't have my own page) to look up some healthy ideas, and ran across this great recipe for Apple-Cranberry Cobbler! It was amazing. We did add in a little more Cinnamon than the recipe called for because I. love. cinnamon. Any great recipe ideas out there from any of you for healthy and/or vegan recipes?!? Oh, and we have started to think about wedding planning, just fyi. Nothing major, just started to think about some ideas. Will post later about them though! This looks divine! I'm a huge health nut and am always looking for healthy and delicious new recipes. I know, right?! I just HAD to make it when I found it! It was super yummy with the extra cinnamon too!